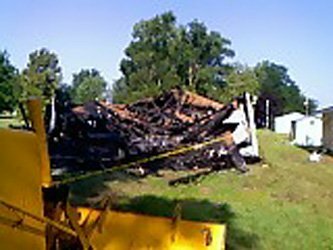 On Sunday morning, August 12th, at 5:56 a.m. the Henderson County Sheriff's Department received a (911) call of a structure fire in Oquawka, at the Ron Killip Construction Company. The Oquawka volunteer Fire Rescue quickly responded within five minutes to 3rd Street between Morgan and Green Streets, with 9 firefighters, 2 pumpers, 1 tanker and a foam unit. "On arrival the 70' x 30' building was fully engulfed in flames, threatening Mrs. Ruth Simpson's home," said Oquawka Fire Chief, Hal Jern. 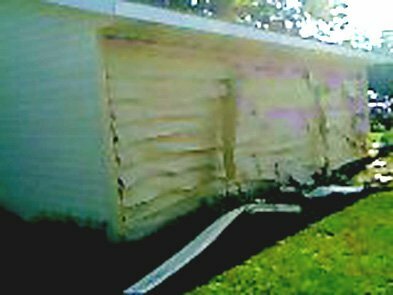 "Although there was heat damage to the garage, our firefighters quickly went to work and prevented the garage (at right) from catching fire, and it was saved. "Temperatures at the fire were a blistering 2,150 degrees, melting and destroying everything," Jern said. Temperatures ranged from 73-94 Sunday. Oquawka's 1972 pumper quickly knocked down a lot of the massive hot fire with it's "deluge gun" master mobile water cannon. Oquawka ambulance service was at the scene for heat exhaustion. Firefighters were on the scene for four hours. There were no injuries. The fire is under investigation by the Illinois State Fire Marshall's office, Oquawka Fire Rescue and Sheriff's Department. A ruling will be coming shortly, Jern reported.